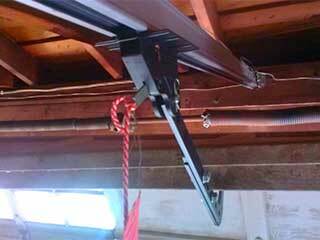 An automatic garage door consists of many moving parts, all of which plays a specific role. Due to the tension involved in the operation of such a system, wear and tear becomes an inevitability. When something goes wrong, the door won't just be rendered inoperable, it could become extremely dangerous to use. Even while everything is in a good working condition, there are parts of your door that can pose a safety risk if they aren't treated properly. But don't worry, there are ways for you to make sure your door is as safe to use as it possibly can be. Every modern opener comes with some form of an emergency release feature that allows you to take manual control of your door. This is incredibly useful and can be downright crucial during power outages and other emergency situations. Knowing where this cord is located and how it works can be lifesaving knowledge, so you should check your owner's manual for a detailed explanation and make sure you understand how the disengaging action works. The best way for you to make sure your garage door is safe to use is to examine all of its working parts and make sure they aren't getting too worn and haven't become damaged. This can help you avoid a lot of potential accidents. You should check the spring (visually, do not try to test their tension as that can be extremely dangerous) as well as the condition of your rollers and track. Give your door panels a look as well. If they've become rusty or developed some rot you may want to get them replaced. Annually repainting them can also help prevent these types of issues. Every modern opener uses an automatic reversal feature that is meant to prevent it from closing the door while a person or object is blocking its path. There are usually two of them. One is a pair of photo-electric eyes that send an invisible beam across the door's threshold. When that beam is interrupted, the opener should reverse. The second feature is more of a pressure based system. If the door senses some level of resistance while trying to close, it will automatically open back up. Testing both of these out regularly is a good way to make sure your door remains safe to use. Place a cardboard box under your door and then order the opener to close. If your door touches the box and does not reverse, you need to reach out to a professional technician right away. Contact our experts at Garage Door Repair Inglewood today.